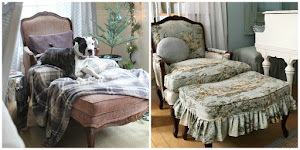 French Aubusson Rugs, Diet plans and little Reeve has the flu! 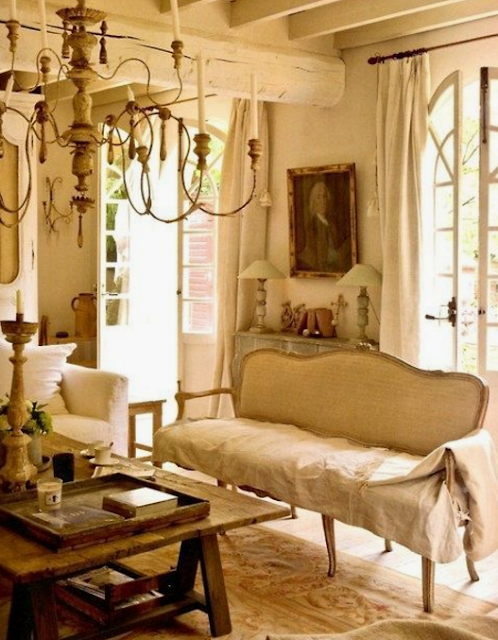 A lovely example of a French rustic room with a fancy needlepoint Aubusson rug on the floor. 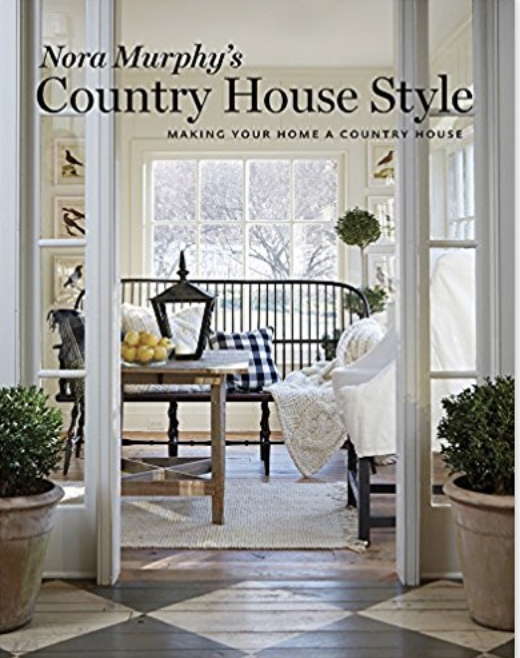 This is the perfect balance of high and low, or fancy and rustic in home decor. 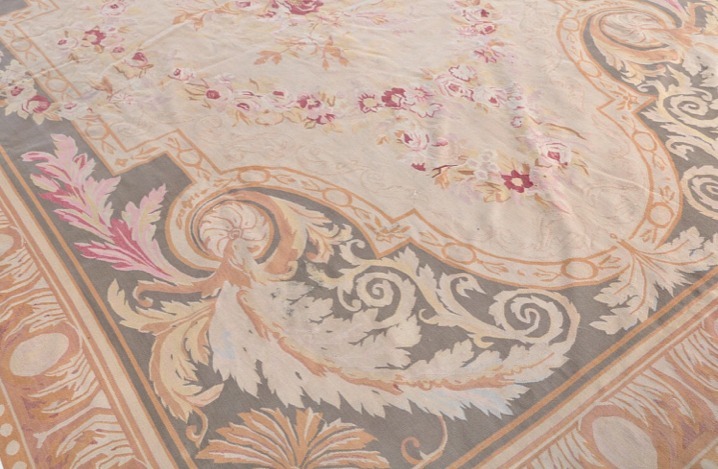 You won't see too many Aubusson rugs used in today's homes, for whatever reason. 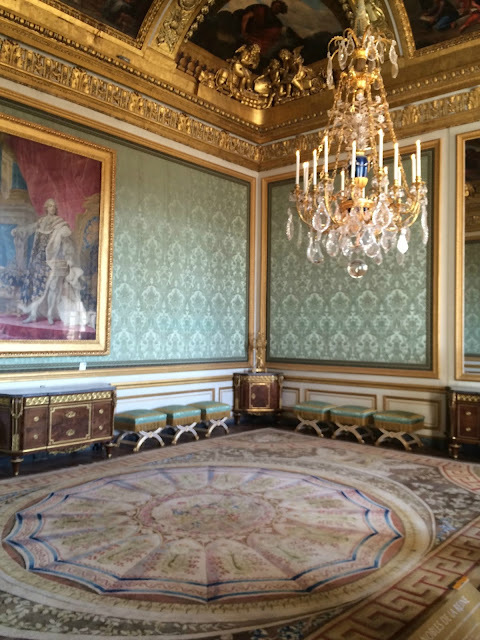 unless you count the rugs found in the Palace of Versailles. 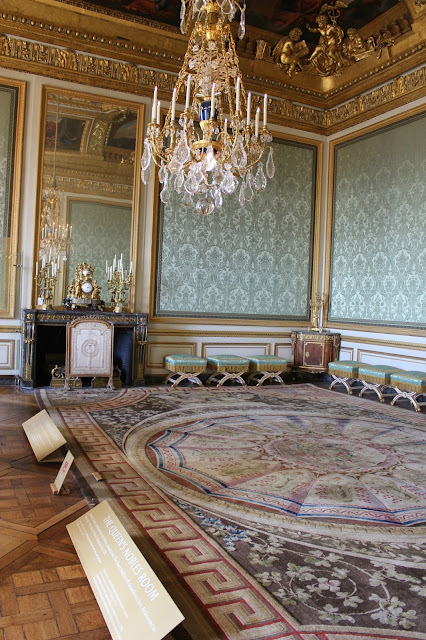 This rug was in the Queen's Nobles Room at the palace of Versailles. that was protected by a ring of velvet ropes. Of course much of the palace was looted in the revolution and over time they have been finding the original pieces or using similar antiques to replicate how Versailles once looked before the revolution. Aubusson rugs with their intricate patterns added to the over the top level of decor that spoke to the wealth of the monarchy. I just love these kind of rugs but imagine them in simpler rooms letting them speak for themselves instead of being drowned out by the layers of ornamentation. It appears they have fallen out of fashion. Oriental rugs, natural grass rugs and basic bound patterned rugs can be found everywhere. near what they are worth. 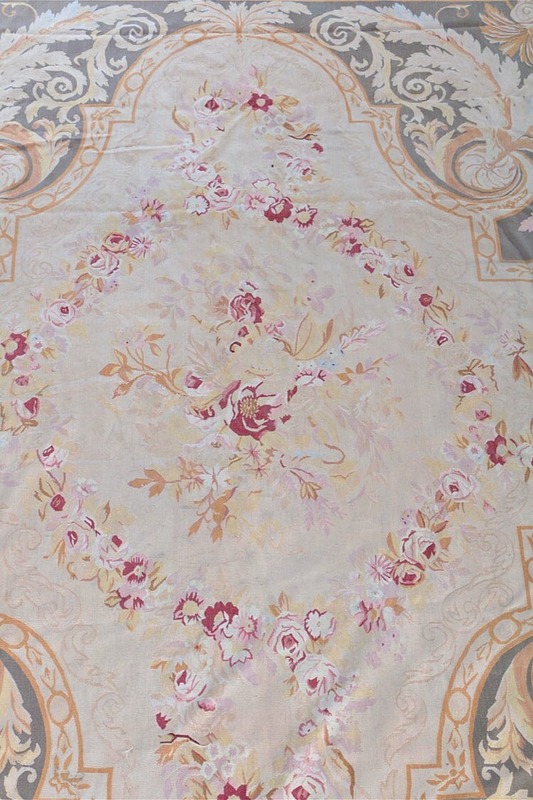 Which is how I scored this room size pink and grey Aubusson for a song. It has a shrimp and poppy pink as well as grey and ivory palette, and when it arrives it will decide where it wants to go. On the wall, or on the floor, or used as upholstery fabric or draped over the piano, I plan to enjoy this pretty floral rug with the classic scroll and leaf flourishes. What a great tablecloth this Aubusson makes! 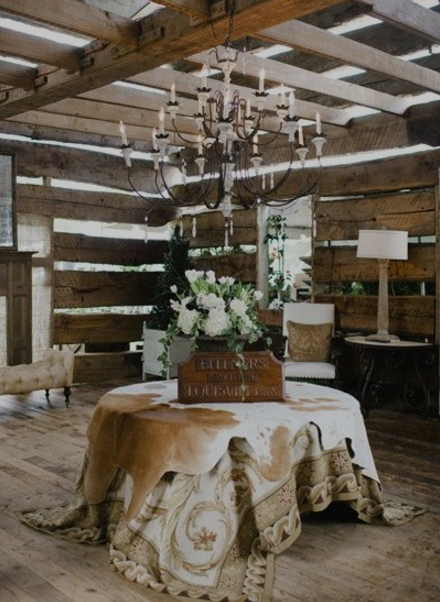 I saved this on my Pinterest page under the category of Rustic Romantic Style. So many ways to use a rug that is finely woven like these needlepoints. On the home front, my little Reeve came down with the flu and has been very sick. Such a cause for worry, this flu has been the scariest one I can remember in many years. She was quite lethargic and not herself, having coughing fits all night and day with lots of congestion and fever. But I am happy to say that this morning she has turned the corner and we are so thankful. She turned eight months old last week, and her daddy took this portrait of her. Even while she was sick she managed to smile and enjoy moments here and there. Half my week I spend caring for her, and she has become a big part of my focus....so while I manage bits of blogging and decorating here and there, real life trumps everything. And puts things in perspective. 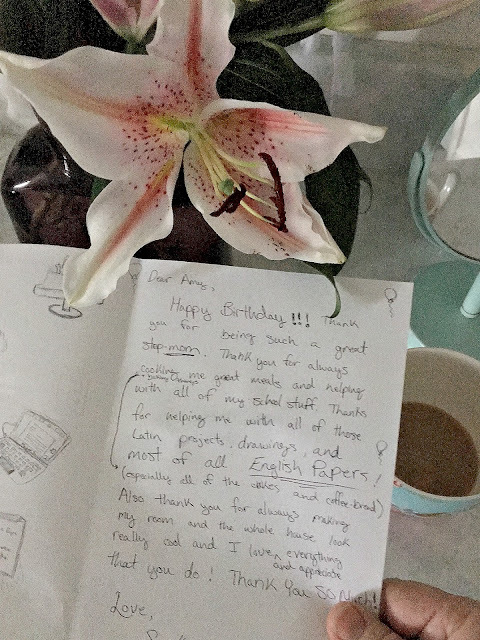 Speaking of perspective, I was given a most wonderful birthday gift from my sixteen year old stepson. While not mentioned often on the blog, he has been in my life since he was two years old. He gave me a handmade card which is going in my keepsake box forever!! You always hope, as a step mother, that you are doing a good job. Loving your own children and your husband's equally. and I couldn't be more proud of him. and he is doing everything right! feels when you get something like this. Reeve will be back tomorrow at Grammy's daycare. She adores Piper and the feeling is mutual. 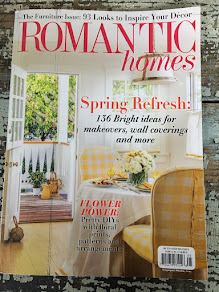 March is upon us, and Mr. Maison Decor and I will be undergoing "March Makeover Month" together. Essentially it means we are going on a diet plan as the pounds have crept up again over the winter months. Our diet plan is basically restricted carbs. No sugar or white stuff like pasta, potatoes, rice, bread etc. In the past I used to do the Atkins diet with great success for years. I was able to maintain my weight and clothing size. So that is what we are going to be doing, starting off with counting carbs and allowing 20 per day. Its a diet that will drop weight quickly, and after the first few days of cravings, you will be able to manage this diet as it allows fats and proteins that keep hunger at bay. If you care to join us, please do, but pick a diet that works for you if you don't want to do the Atkins diet. I hope to be posting updates on things that work for us as well as our weight loss as we move through the month of March. When Spring arrives, we will be in shape and ready to button up our pants with ease!! The iconic Kitchen Aid stand mixer. I have never owned one and I do a fair amount of cooking and baking. 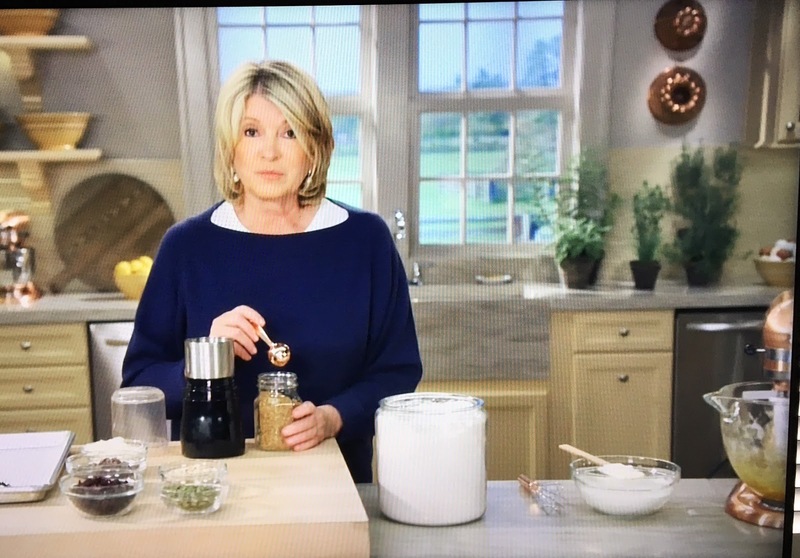 A hand mixer was the way I handled mixing up batters and whipped cream and pie fillings for decades! 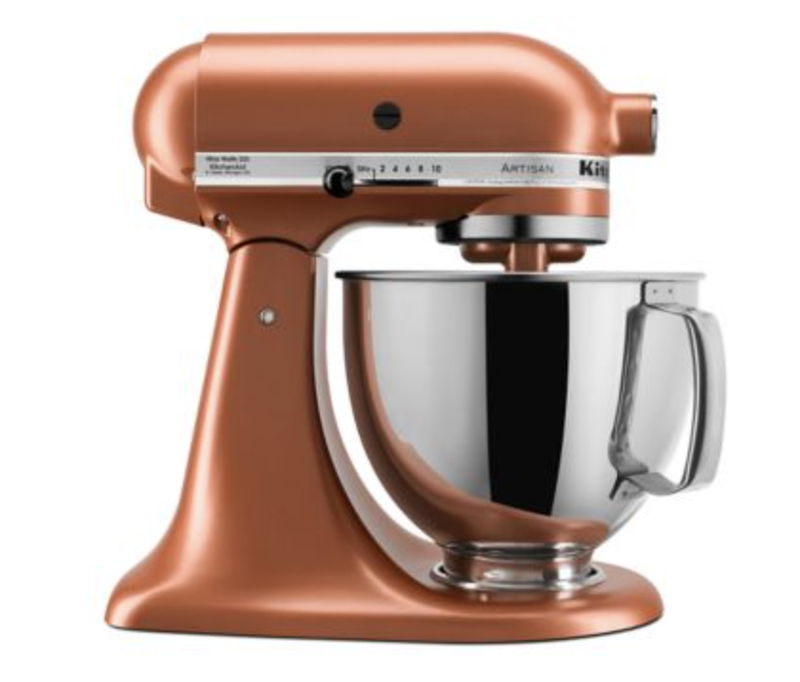 But once I spied the copper colored Kitchen Aid mixer I decided it was time for me to get one. My sister has one, my son and daughter-in-law have one, and even my grandmother had one. 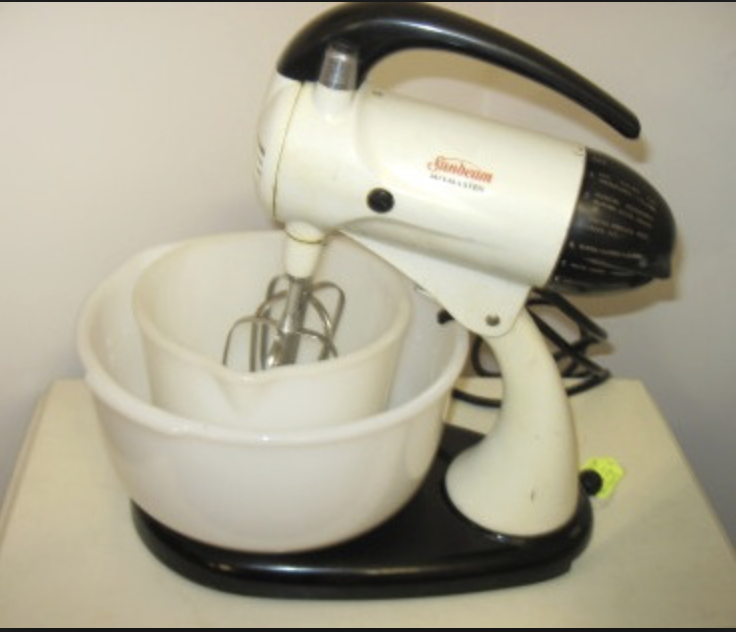 Nana had the old Sunbeam Mixmaster, a stand mixer that predated these more powerful mixers by Kitchen Aid. Once I decided to get one, I found that it wasn't as simple as picking a color, I had to pick a model first, as there are many models to choose from. The engines that run the mixers get more powerful as the size goes up. The mini Artisan has a 3 quart capacity, the Artisan Tilt Head holds 5 quarts, and the Professional model holds 6 quarts. 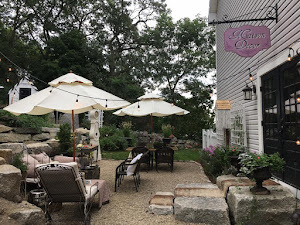 The capacity is what helped me make up my mind, as I might be mixing up a box cake mix, a batch of cookies or maybe even two loaves of bread, so I chose the Artisan Tilt Head model, which is the most popular choice of home chefs. The largest size would be more difficult for everyday mixing of normal size batches of ingredients. Next I would look for the copper color I loved. 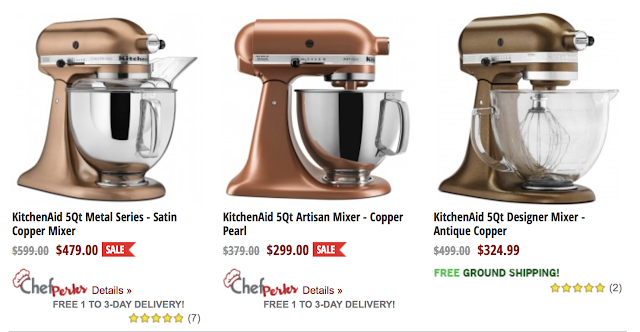 Turned out there are more than one copper finish offered by Kitchen Aid. 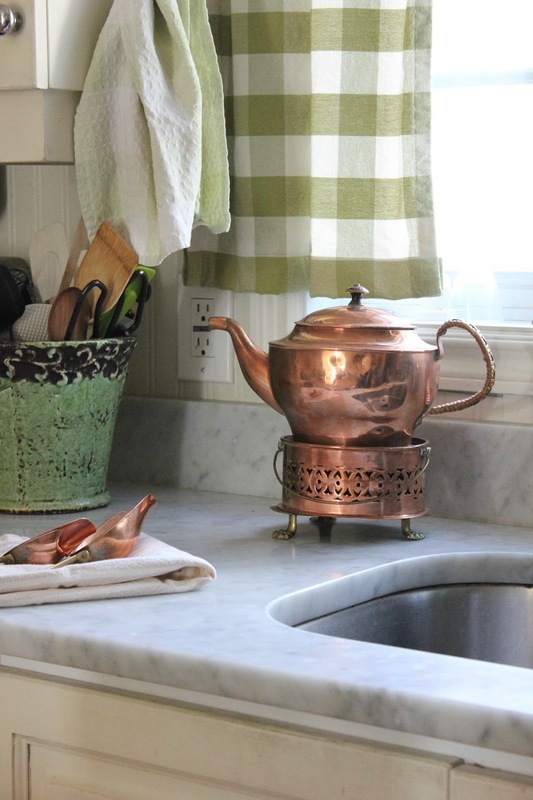 The prettiest shiniest copper finish is the "satin copper". 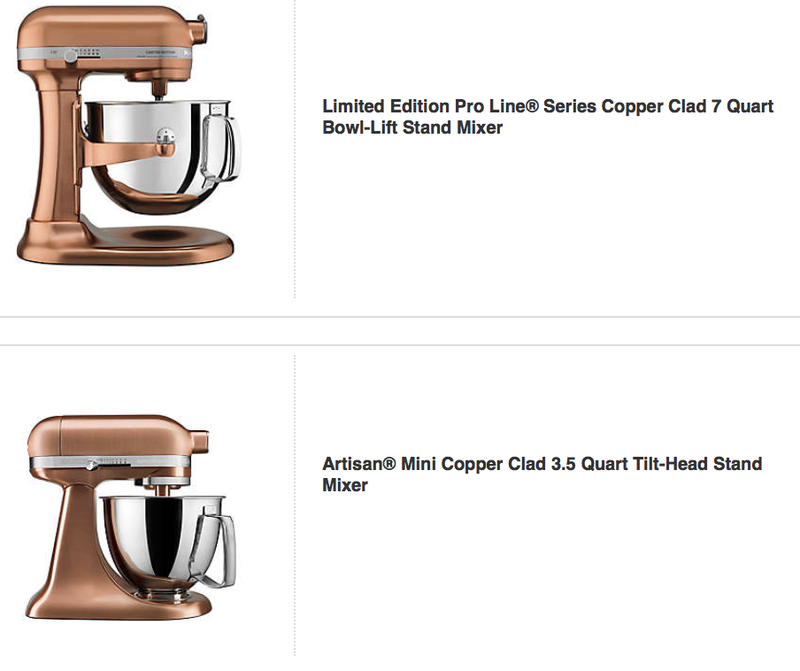 A search on Kitchen Aid's website shows two mixers in copper. The largest was a 7 quart Professional Limited Edition Pro Line Series. shows when searching "copper mixer". but this model is just too small for my needs. However the price was also too steep. The other range of colors were offered around $399.99, and an upcharge of $200 seemed unfair. Amazon revealed a Copper Pearl finish in the 6 quart size for $399.99, which is a great buy, but I wanted the Artisan 5 quart model. Still determined to find a Kitchen Aid mixer in copper at a price I was happy with, I pressed on and continued my online search. The day it came, I excitedly got it out of the box and set it up on the kitchen sideboard. I was really happy with the color! 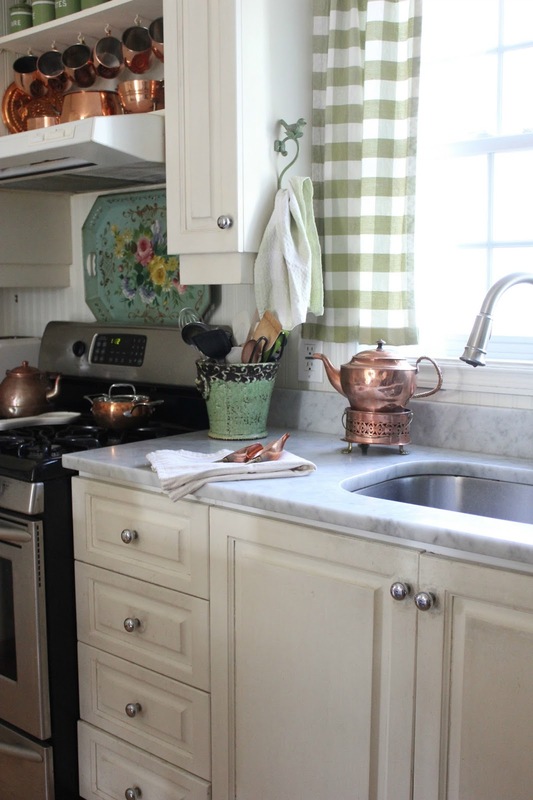 These mixers are usually too tall to put on the counter if you have upper cabinets, so make sure you have a place to put your beautiful mixer. I wanted to look at it as a part of my kitchen decor, so that was important that it have a place to sit everyday. This quick Instagram pic shows the finish, and although it is not as shiny as the real copper items you see next to it, its pretty darn close. Reeve loves to sit and watch me cook in the kitchen, and now with my new copper mixer, it gives us more reason to have fun in the kitchen together. Do you have a Kitchen Aid Mixer? What color and how do you like it? Was it a gift or something you decided to buy for yourself? I would love to know! 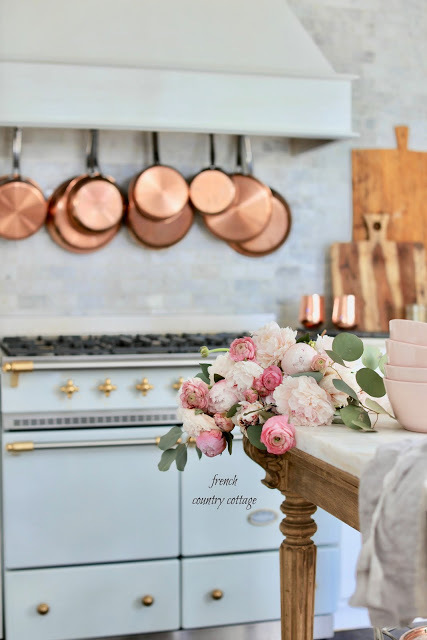 Copper is trending again in kitchen design, and after seeing it in some of my favorite designer's kitchens, it ignited a desire to start collecting copper cookware and accents for my kitchen. Green accents like the French enamel canister set and buffalo check curtains and tole tray won't be going anywhere, instead I planned to mix in some warm pretty copper pieces to give it a fresh look. there that I was able to get a bunch of old copper pieces when visiting an antique market. 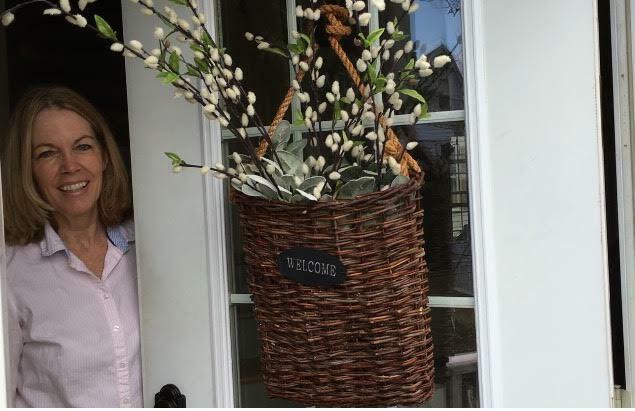 The handled piece on the island holds a pot of flowers from the supermarket and I can imagine just changing this out as the blooms fade. Maybe some pansies in spring, and then some herbs in the summer. 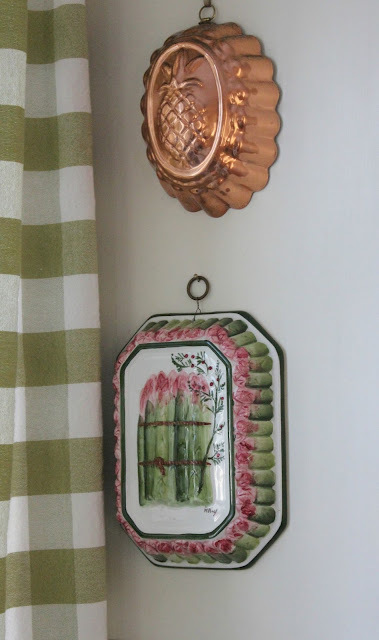 I made room for a shelf full of copper, hanging up the copper mules I already had from last year, with some smaller pans, a cute tiny berry colander with brass feet and a cheese grater with brass handle. Some copper scoops were found at an online auction in a mixed lot set of vintage copper. The teapot by the window was found in Canada and hails from Denmark. This pretty teapot sits on its owning warming station, that holds coals to keep the teapot warm. It had a lot of lovely handmade details and was the last piece I spotted in the antique market. including the heart shaped mold that has a pair of swans. especially appropriate today on Valentines Day. 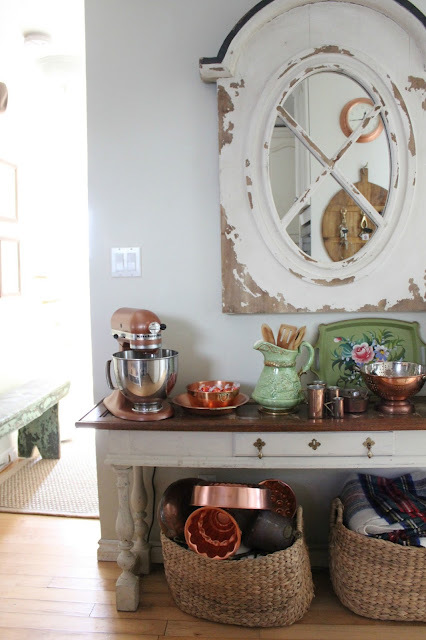 There is a load of copper that I still have yet to hang up or figure out what to do with, but I imagine a wall rack to go over this kitchen sideboard where I keep my new copper Kitchen Aid Mixer. Believe it or not, I have never owned a big mixer like this, and I have to say I am loving everything about it! I made a birthday cake and a pumpkin pie, and it was so much nicer than using a hand mixer. It might take a little time to display it in the way that I want to, but I will be sure to share when I do. 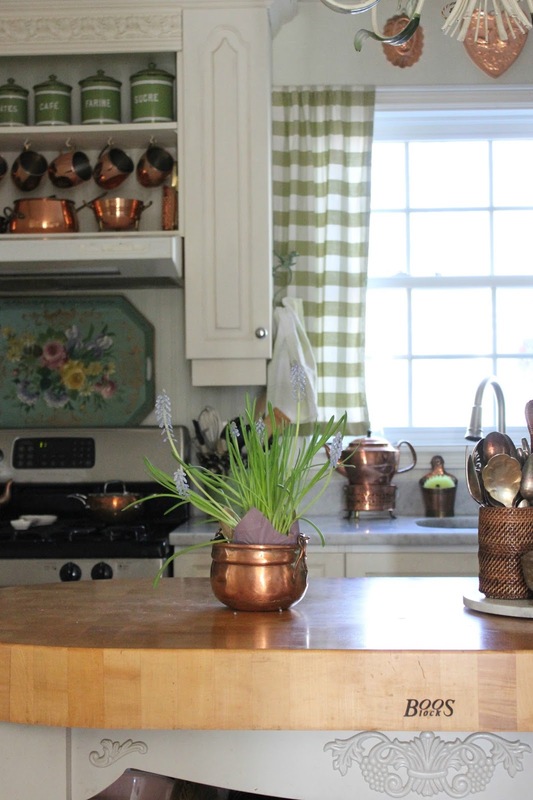 A copper colander just like I had in the 80s and some copper measuring cups were just part of the vintage copper group I found on the EBTH website. See the old English copper clock in the mirror's reflection? That was found on the website Chairish, another new to me online auction site. a french country kitchen with copper accents. 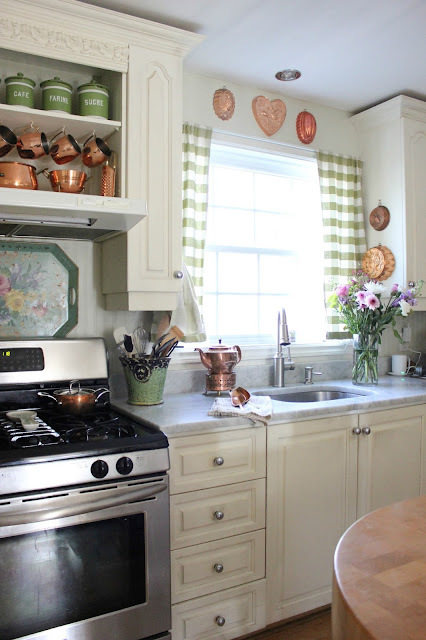 Copper cookware and accents used in kitchens is nothing new in design, but as trends come and go, this is one that has stuck around. My first kitchen in my very first apartment was outfitted with copper accents. 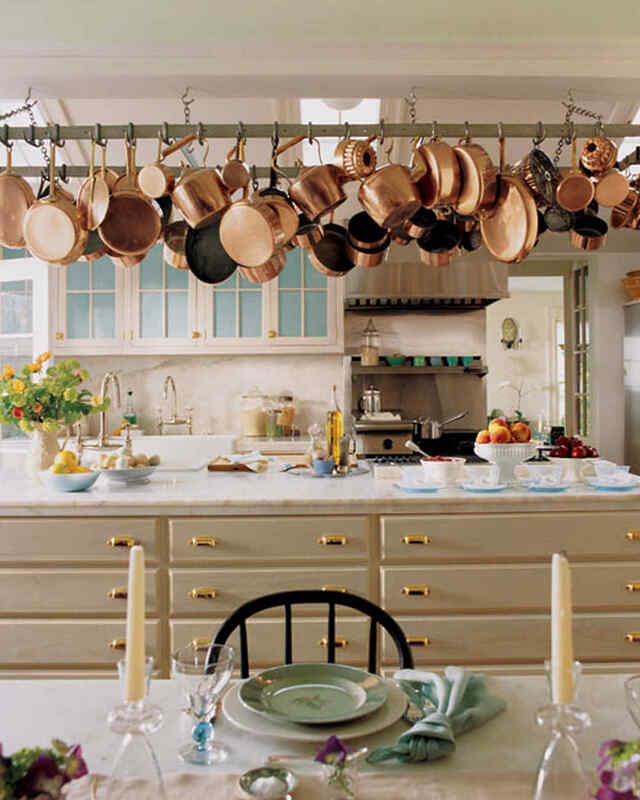 I had a big copper pot rack and it hung above a second hand copper colored Tappan range. Copper canisters and a copper colander and a few other copper accents made my kitchen the country kitchen of my young dreams. Fast forward through a series of house moves and over time the copper disappeared from my kitchen decor. Maybe I just switched my attention and copper lost its fascination for me. Well, I am here to say I have fallen in love with copper all over again! 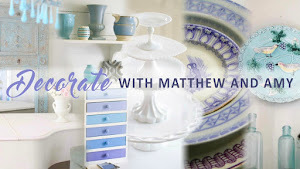 It seems as if I am not alone, as it is appearing in kitchens of some of my favorite designers and bloggers. Martha Stewart has led the way in setting trends and making certain antiques popular once again when she uses them in her own kitchens and on her baking show. I spy two (!!) copper Kitchen Aid mixers and measuring spoons and copper molds on the wall. The copper looks beautiful with the marble and the breadboards and the rustic potted herbs. 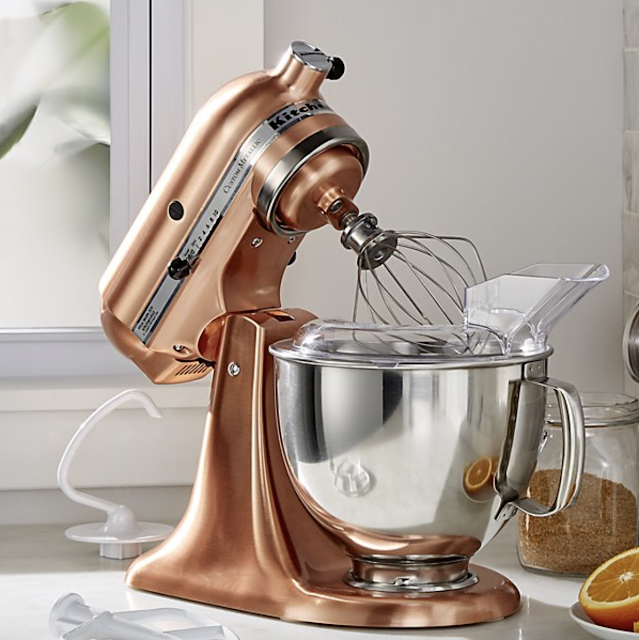 I developed a fixation on Martha's copper Kitchen Aid mixer, and the next thing I knew, I was researching the models, the color finishes, and am happy to say I found one at a very good price. My next blog post will be about my mixer and all that I discovered, as soon as I take some pictures of it in my kitchen. 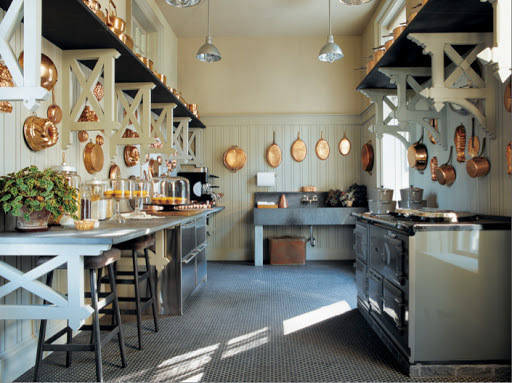 Until then I am sharing some amazing copper in amazing kitchens that hopefully inspire you as much as they did me. and holds a shameful amount of copper pans. It is both obscene and inspiring! 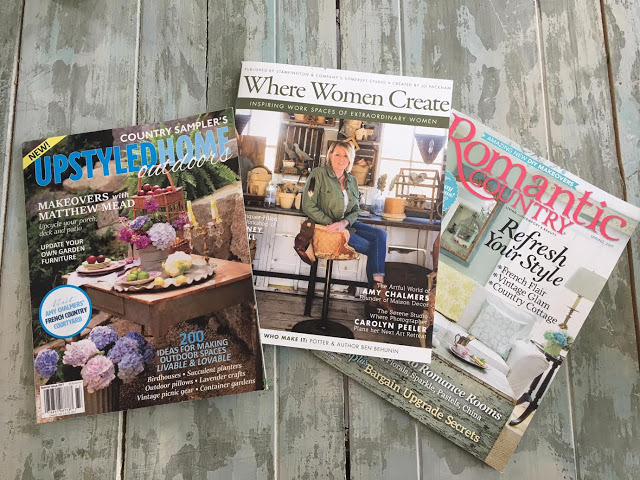 If you look closely you will see a stainless pot sitting on the cooktop, making one wonder if this collection is purely decorative. Even so, I have to say the copper looks amazing! 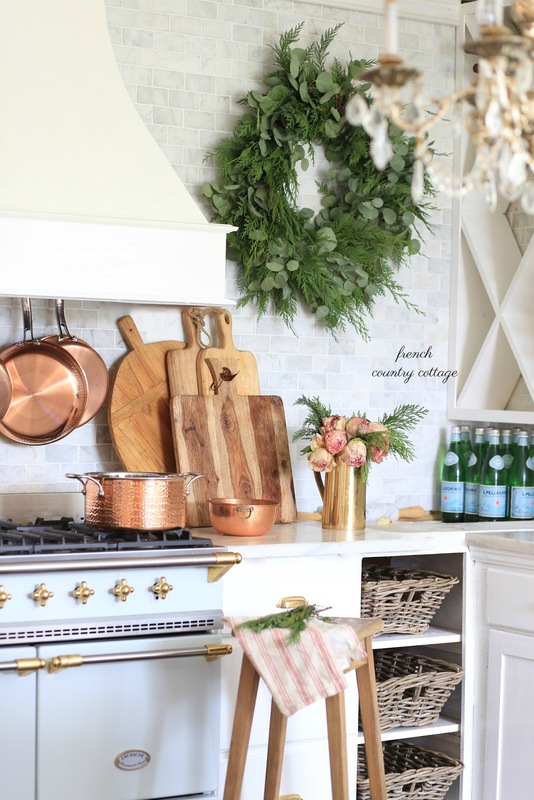 the range hood positioned over her blue French LaCanche range. 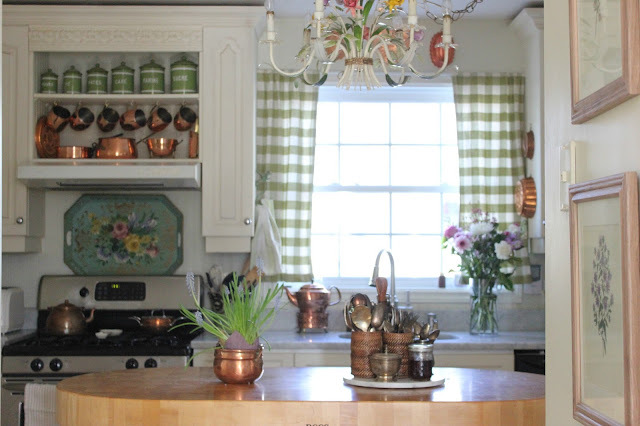 Another peek at Courtney's kitchen....just a few well placed copper accents give this kitchen the French cottage charm I love. Her kitchen also gave my obsession over copper fuel that I was on the right path. 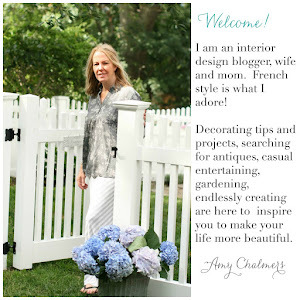 My collection has grown after searching online antique listings, antique shops, thrift shops, Marshalls and HomeGoods, which are all great places to find copper. Target and Kohls carry copper accents, so if you are like me, once you start looking for it, you can be certain you will find it. 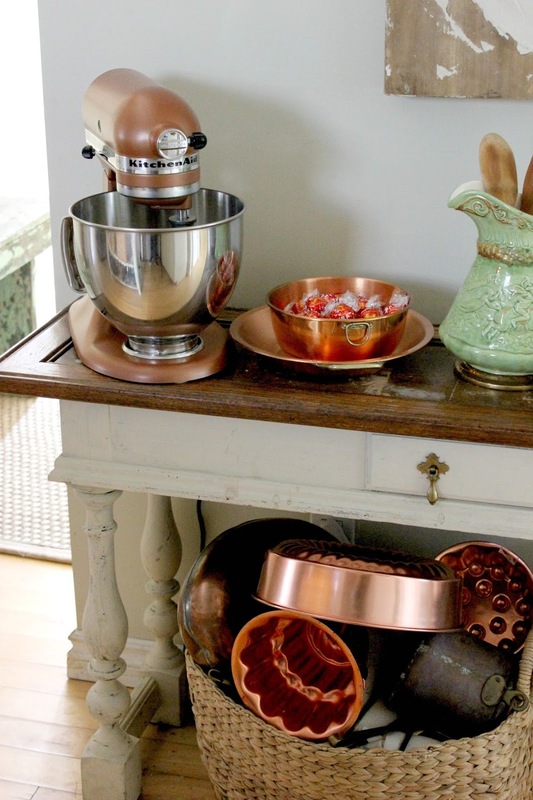 and that fabulous copper Kitchen Aid mixer! I promise I will be back soon with some photos as soon as I finish hanging things where I want them. Having a lot of fun with my on again off again obsession...can you tell?